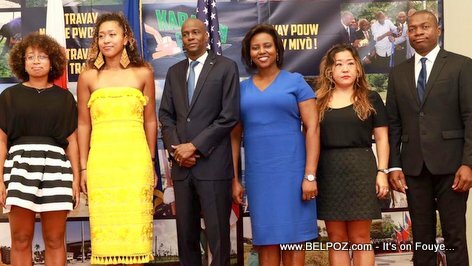 Haitian President Jovenel Moise and his wife, first lady Martine Moise, welcomed Haitian-Japanese tennis champion Naomi Osaka and her family to the National Palace on Thursday November 8 2018. Naomi Osaka was accompanied by her sister Mari Osaka, her Japanese mother Tamaki Osaka and her Haitian father Leonard Francois. "The First Lady and I are pleased to welcome to the National Palace our compatriot Naomi Osaka, recent champion of the US Open, as part of a ceremony organized in her honor."